What is fine art photography? Is photography art? Indeed, many artists suggest that photography does not belong in the art community? Join the discussion on fine art photography and its place in the world of art. 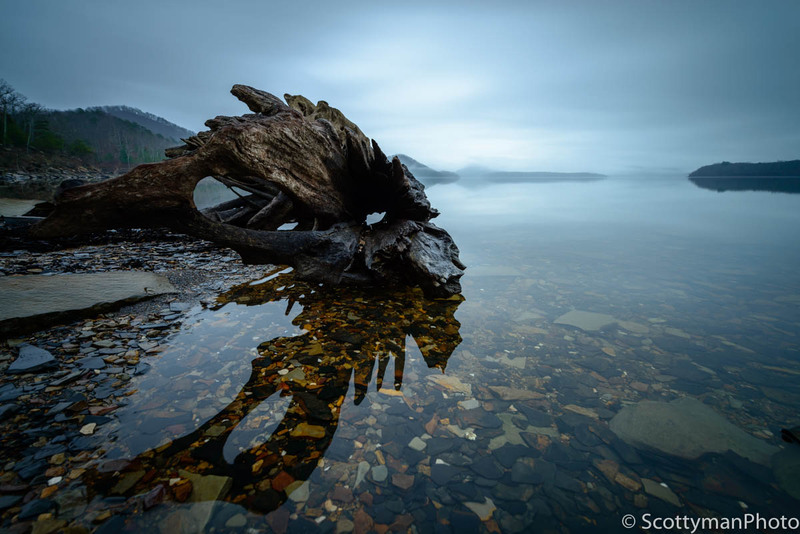 An image of an early morning sunrise at Cave Run Lake with fog covered mountains and a large piece of driftwood in the foreground. This image was captured near the High Bank Area of the lake. Until recently, I can’t remember a time when I heard the words fine art, and photography in the same sentence. Actually, it’s difficult to pinpoint when the link between these words began. However, to my surprise, many past articles made reference to fine art photography. In fact, the phrase “fine art photography” starting as early as 1961 by Dr. S.D. Jouhar who founded the Photographic Fine Art Association. Furthermore, according to Richard W. Christopherson, he defined “fine art photographers” as “those persons who create and distribute photographs specifically as ‘art. '” Nowadays, the phase fine art photographer has become relatively common in the photography community. In fact, many photographers, myself included, refer to themselves as fine art photographers. So, what is fine art photography? Well, perhaps the answer is a bit premature; it’s imperative first to discuss the definition of art itself. What defines art and who decides what is art? The New Oxford American Dictionary defines art as, “the expression or application of human creative skill and imagination, typically in a visual form such as painting or sculpture, producing works to be appreciated primarily for their beauty or emotional power.” With that said, it’s hard to imagine a rational dispute over whether photography is, in fact, an art. However, despite this widely accepted definition, many people in the art community fail to recognize photography as a true form of art. In fact, art critic and columnist Jonathan Jones wrote, “photography is not an art.’ It is a technology.” Indeed, this controversy stems from an egregious and widespread misunderstanding of photography itself. 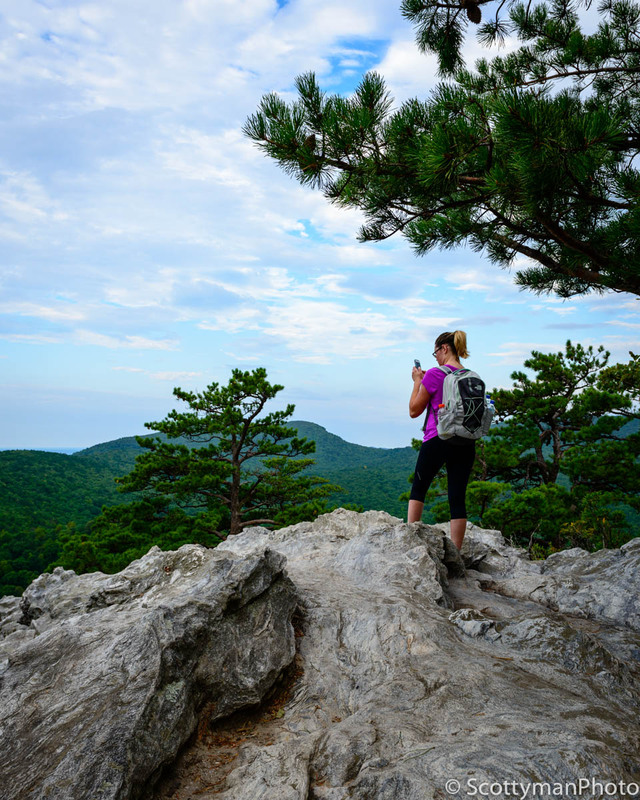 An image of a woman taking a picture with her smartphone while at Hanging Rock State Park in North Carolina. To answer the question of whether photography is art, or for that matter, what is fine art photography, one must first define the word photographer? The Oxford Dictionary describes a photographer as “a person who takes photographs, especially as a job.” Well, by that definition, I’m a photographer on the one hand but not the other. Although I do “take pictures” and sell my “art,” I certainly don’t make my living doing so. In fact, the cell phone has placed a camera on almost every corner of the world. Does this mean we have transformed the population of the world into photographers? Of course not, but perhaps we’re asking the wrong questions. Maybe the question we should be asking is whether the photographer is an artist. Is a photographer an artist? Indeed, this is the controversial element where someone’s feelings may be hurt; although that’s certainly not my agenda. On the contrary side, many traditional canvas painting artists refuse to compare their skills with someone who merely snaps a picture with a device that does all the work! Nevertheless, a photograph may be as stunning as a hand-painted landscape. Regardless, a typical painter may devote several hours or even days stroking a canvas, giving attention to the most minute details. Whereas the “photographer,” utterly pulled off the road and snapped an iPhone pic through the windshield. Honestly, are both examples worthy of the title artist? Although both the canvas and photograph may fall into the category of art, one represents a talented artist, the other, a lucky photographer. Nevertheless, both scenarios produced art; does that mean every photographer is an artist? What makes a photographer an artist? 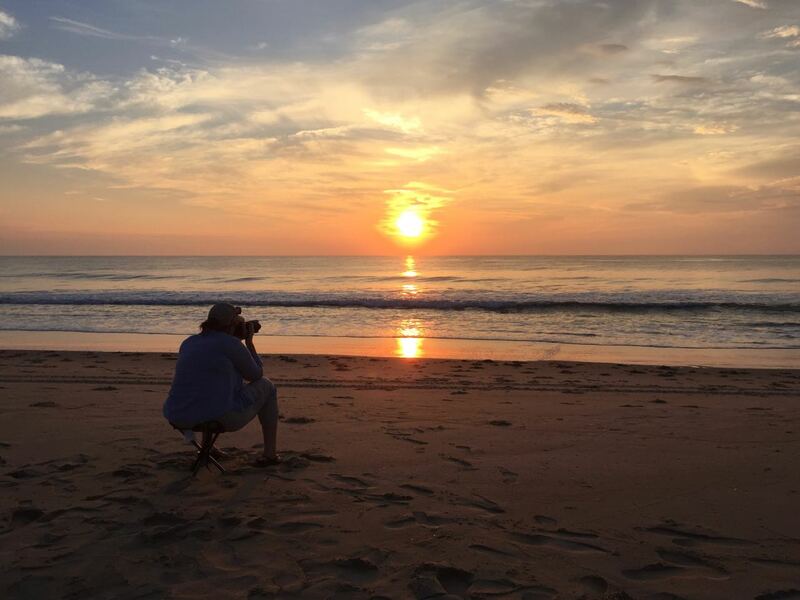 An image of a woman photographing a sunrise on the beach. The Oxford dictionary defines an artist in three ways. Firstly, “a person who creates paintings or drawings as a profession or hobby.” Secondly, “a person who practices or performs any of the creative arts, such as a sculptor, film-maker, actor, or dancer.” Lastly, “a person skilled at a particular task or occupation.” In short, the overarching message appears to emphasize skill. Consider the “artist” that blindly splatters paint on a canvas as opposed to the photographer who spends years mastering exposure, composition, and the many tools necessary to capture an artistic vision. Honestly, who’s the artist now? Unfortunately, many people fail to recognize the skills and discipline required in photography. In fact, many factors such as post-processing, cameras settings, and knowledge of the exposure triangle play a significant role in the final product. Whether digital, film, or canvas, a successful artist is a product of ability, passion, and determination. Remember, by definition; an artist is a person skilled in a particular task. Indeed, not every photograph is art, nor is every photographer an artist. On the other hand, not every painting is art, nor every painter an artist. However, that’s certainly a matter of opinion. Nevertheless, despite the best efforts to describe the contrast and parallels between photography and art, beauty is in the eye of the beholder. In fact, many so-called “works of art” have only a small audience and fail to impress the average person. Conversely, a simple mundane image may excite an entire nation, but never see the inside of an art gallery. Opinions aside, in reality, people perceive art in various and often opposing directions. Whatever the medium, e.g., photograph, painting, or a sculpture, if it elicits attention or ignites an emotional spark, consider it art. Finally, what is fine art photography and what separates it from other forms of photography? In my opinion, a fine art photograph typically begins like any other; though, a vision or concept of the final product usually precedes the picture. In other words, fine art images are generally the product of careful planning and meticulous attention to detail. With this in mind, I consider many of my photographs as average. Indeed, the average picture-taker gives little or no thought to composition, lighting, or post-processing; just center the subject, point, and shoot, and let the camera do the rest. Of course, even the most expensive camera cannot replace human ingenuity. Thus, significant decisions such as depth of field and shutter speed are frequently left to the camera. However, fine art photography requires infinitely more forethought. Moreover, it is not the technology that creates art, but rather the photographer who masters it to create an artistic composition. Read my philosophy. What is fine art photography according to Michael Scott? Like most matters, everyone has an opinion. With that said, fine art photography requires artistic creativity and preparation. Although the composition remains the key ingredient for any successful image, fine art photography demands a bit more finesse. In fact, fine art photography is analogous to the precise and deliberate strokes of a brush on a canvas. Like any artist, the fine art photographer deploys artistic creativity to compose an image carefully and meticulously refine it in post-processes. Indeed, many fine art photographers use software such as Photoshop to enhance, and or digitally alter an image. In fact, these actions alone satisfy the very definition of an artist. The Oxford Dictionary defines photography as, “the art or practice of taking and processing photographs.” So, in contrast to photography, what is fine art photography? Simply put, it is photography with the addition of artistic creativity and preparation. Comparatively speaking, instead of masting a brush to paint a canvas, a fine art photographer masters technology, composition, and exposure to compose and process a photograph. SEE MORE OF MY TIPS. See my Portfolio page or view my Fine Art Gallery at Fine Art America.